(Narrator)>> Four wheel drive versus all-wheel drive. What's the diff? We'll convert "Project RedTide" into all wheel by sourcing parts to bring full time power to every corner, and our five-three LS gets top end goodies to bring the go! It's time for Truck Tech. (LT)>> Today we're gonna be spending some quality time with "RedTide", our '88 Chevy 1500 four wheel drive that's been lowered down to the ground, and we're gonna be doing something that to my knowledge has never been done before in an old body style GMT 400 Chevy truck. Now last time you guys saw "RedTide" we had yanked out the old t-b-i 350 and we replaced it with this 400 horse five-point three liter LS and a Four-L-80-E automatic trans, but it's just a bare engine and trans. There's no accessories, exhaust, intake, or wiring that we'll need to make it all run. And we'll take care of that in just a little bit but first we just got in some new drivetrain parts that I'm dying to show you. So just ignore the stuff over here for a minute. Our truck originally came equipped with an NP 241 two speed mechanical shift transfer case, and out front a GM eight and a quarter inch independent front differential with a passenger side axle disconnect. Now there's really no reason we can't reuse both of these parts. On the transfer case all we'd have to do is take it apart and swap out the original 27 spline input shaft for a larger 32 spline input that'll work with the Four-L-80 transmission. It would only cost about $100 bucks and take 30 minutes to take apart the transfer case and make the switch. 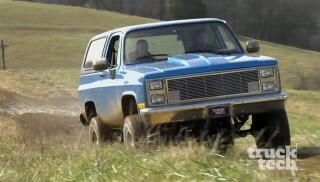 Having a lowered four wheel drive truck is cool, and a lot of guys who drag race simply shift into four wheel drive at the line, make the pass, and shift out of four wheel drive at the end of the track. As long as you're driving in a straight line on pavement the four wheel drive system will work just fine, but you cannot use it driving around corners. Now that's fine if all you want to do is go drag racing but we want to build something just a little bit different. 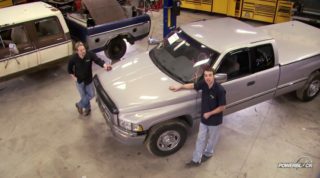 Now if you know of the Silverado SS that was made between 2003 and 2006 you'll remember that it was a full time all-wheel drive truck, and it used a special transfer case with a viscus coupling inside that split the power 62 percent to the rear and 38 percent to the front, and we just found one. This is an NV 149 transfer case we picked up from Powertrain Products, and it's been remanufactured with a new chain, bearings, and seals. Now this was intended to be a replacement part for a later model truck but it'll work perfectly to convert our old Chevy into a full time all-wheel drive traction machine. Now this will still work great at the drag strip for those launches, but you can still use it in everyday driving conditions as well like snow, ice, dirt roads, or even just dry pavement, and you don't have to worry about switching into and out of four wheel drive. 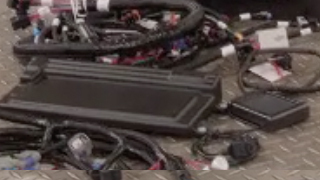 The best part about the 149 case though is that it's a completely mechanical device. 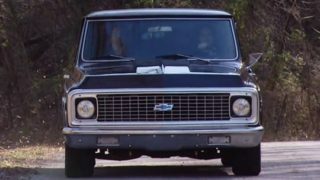 Meaning there are no wires or control modules needed to make this work in our classic Chevy. 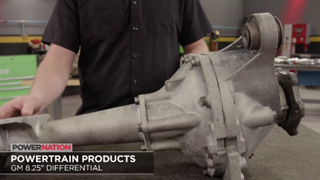 One very important thing about running a full time all-wheel drive transfer case has to do with the front differential. 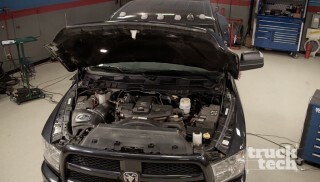 Both axle shafts have to be receiving power at all times, and if you'll remember this differential has a disconnect on the passengers side. So that axle just spins freely. Now there's a small fix for that if we want to use this axle. One solution would be to remove. 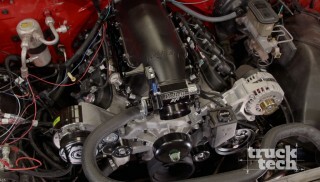 The thermal linear actuator and install this four by four permanent lock I picked up from Summit Racing. It pushes in on the shift fork, engaging the passenger's side axle, and a pair of set screws pulled it in place. This is an inexpensive way to get the job done. But sending a lot of power through a locked out axle shaft may not be the best long term solution, especially on a vehicle that's gonna spend a lot of time at highway speeds. Instead I ordered a rebuilt front differential from Powertrain Products that fits the Silverado SS, certain Escalades, and Denalis. This one has a 4.10 gear ratio, which is gonna be perfect for our truck. 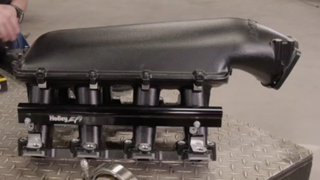 This has the updated pinion design to prevent the common failures, and since this is from an all-wheel drive application it has the much stronger one piece passenger side axle shaft. Now the '88 to '98 trucks have a totally different frame than the '99 to '07 trucks that this differential was designed to fit. Now honostly when I ordered this I had no idea if it would even work but luckily it's a much closer matchup than you might think. (LT)>> There are no off the shelf parts made for this swap but it's just one of those situations where you have to get a little creative, use some fabrication tools, and you can build anything you need. It's these little steps that'll transform a run of the mill build into something that's truly unique and one of a kind. With the front differential in its new home the only thing we have left to do to convert this truck to all wheel drive is install the transfer case. Now these NV 149's were only found behind four-L-60's that had a 27 spline output shaft that keys in to the input of the transfer case. 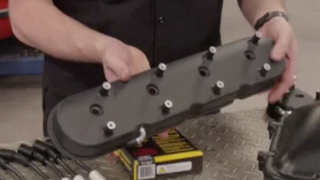 On most four wheel drive transfer cases that's not a big deal because there are some readily available factory parts, like our 241, which came behind four-L-80's in certain applications. The 149 though never came behind a four-L-80. So there are no readily available factory parts we could use to make the switch. There is however a company up in Michigan that custom manufactures shafts, and they built us a 32 spline input shaft that goes inside of our NV 149. So all we've got to do is take this thing apart and make the switch. (Narrator)>> Next transfer case tech. (LT)>> It could be floating around up and not picking up any oil. (LT)>> We're opening up a brand new transfer case for "Project RedTide", and in the process building a truck that's unlike any we've ever seen, making what we think will be the world's first all-wheel drive GMT 400 Chevy truck. To accomplish that we need to install a different input shaft into this NV 149. The rear bearing C-clip is disengaged through an access hole and using a pair of pry bars the glue sealing the two case halves together is cracked open, and the rear half of the case is removed. Now for the rear planetary and main shaft slide out, followed by the sprocket and chain. Brand new chain! This guy right here, this is the viscus coupling. This is actually a non-serviceable item but this is the part that makes the all-wheel drive magic happen, and that is our input shaft. The last part holding the input shaft in is a CClip, and once it's removed a few gentle taps of the plastic dead blow frees it from the case. Finally one more C-clip has to go and the hammer helps remove the bearing. Now the process gets reversed with the bearing and C-clip going onto the 32 spline shaft. Always want to take your time to make sure the snap rings are fully engaged in the slot cause if they're things could come apart and do a lot of damage. This guy's set, so back in it goes. You ready? (LT)>> Hear the sound change? (Eric)>> I think you're in. (LT)>> It's a bit awkward but the case gets maneuvered up between the two cross members. The shafts line up, and with a bit of wiggling the trans and transfer case are united. A few bolts hold the whole package together completing our all-wheel drive conversion. Hey guys. (Pat)>> Last time I saw this truck it was covered in mud and it had large tires on it. Now it's totally change. LS swap and I don't know what kind of cajavis is in this thing now. This all new looks new. What's going on? (Tommy)>> You've been busy for sure. (LT)>> I've been a little bit busy yes. So we're trying to make something that's a little bit different, a little bit special. 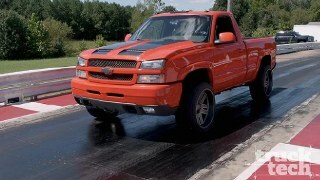 So we made an all-wheel drive truck right? Something that they never made in this GMT 400 platform. So I robbed a bunch of parts from a later model truck actually. Transfer case, that's from the Silverado SS', maybe the Escalades and Denalis. The front differential, this is probably my favorite part about this whole swap. This front diff even though it's from a '99 to '07 truck it actually on this side bolted right in, and the only thing I had to do was build a custom mount on the passenger side. But I mean the axle to axle width was the same. The bolt pattern for the c/v's was exactly the same. (Pat)>> You built this mount? (Tommy)>> That's pretty impressive that the track width and all is dead on. (LT)>> I think that's my favorite part about this whole thing is cause I've had this whole idea for a while, that I wanted to try to build an all-wheel drive truck. Really I ordered that front diff entirely on a whim not even knowing if it would fit, but it's so close it's actually almost perfect. (Tommy)>> Yeah that's pretty neat that you went down this path. You know I'm a big fan of the S-10 trucks and now it's full size. That's way cool! (Pat)>> I really like it and now with the LS swap you have a lot of potential to make more power because of all the parts that are available. (LT)>> It all comes down to something you can use every day. So if you have a whole lot of power, you drive it in the rain or the snow you're just gonna be spinning out. So all-wheel drive, use it all the time, and just be different I guess. (Pat)>> It's definitely different but I like it and I like it a lot. So good job! (LT)>> So you guys want to do any sanding and painting? (Tommy)>> He's pretty good at painting. (Tommy)>> Speaking of paint what about that blue transmission? That thing's kind of electric under here. (Pat)>> Very patriotic with the red truck. (Narrator)>> Next here come da power! (LT)>> Our all-wheel drive conversion is done on this old body style Chevy. Now I could spend some time out back and re-gear the 10 bolt to a 4.10 ratio. That would match the new front axle that we just installed, but instead I'm gonna spend some time on this engine and see if we can get it a little bit closer to firing up cause right now this five point three is just a bare long block. All the important parts that it needs to fire up and run haven't been installed yet. Recently I did some shopping and the delivery guy, well he just dropped off a whole bunch of parts. I started out by going to Summit Racing and picking a set of ceramic coated long tube headers. Then I welded on some stainless steel three inch v-bands that'll connect to our exhaust later on. 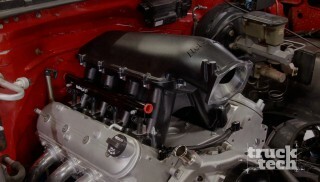 Then for an intake manifold I picked up this Holley High Ram with a wrinkle black finish. Now it looks great but the long runner design is gonna help great low r-p-m torque. And if we ever decide to install a power adder it's gonna work great there as well. 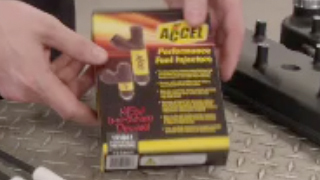 I also picked up a set of matching wrinkle black Holley valve covers, and Accel sent us some 61 pound per hour fuel injectors and some ceramic coated spark plug wires. 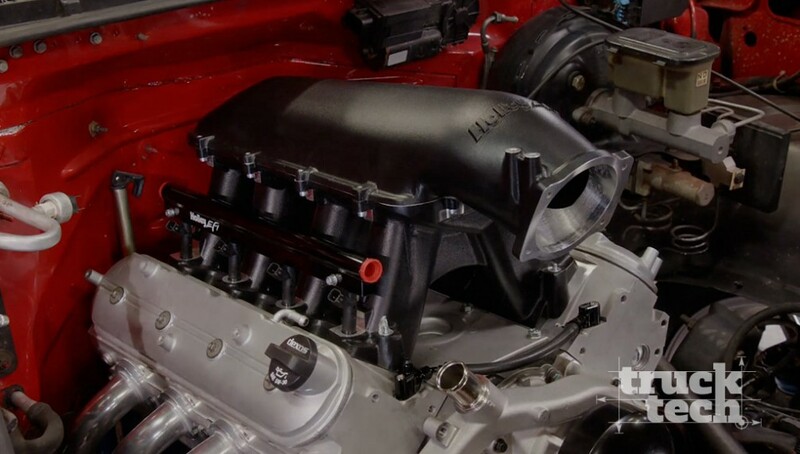 Then Summit sent us a few more odds and ends to complete the swap, like a water pump, starter, ignition coils, cam and crank sensor, and a dip stick, and it's all gonna be controlled by this Holley Terminator LS multi-port injection setup. But we'll get started by installing the headers. These are a Pace Setter header designed to fit a '99 to '07 four wheel drive Silverado but luckily they're a perfect fit for our LS swapped truck. On the back of the block the cam shaft sensor slides in, and up front the steam vent adapters attach to the cylinder head, which later get connected to the radiator to relieve pressure in the cooling system. Then the front of the block is quickly prepped with a scuff pad, and the water pump gets bolted into place. We need to install an O-ring to seal the lid to the intake. It gets trimmed to length and a couple of dabs of r-t-v hold it in place. The lid goes on and gets bolted down. Now all eight injectors get lubed up and slid into the fuel rails, and the whole thing installs into the intake with just a little pressure. It all gets held in place with two bolts and spacers. 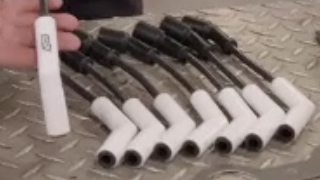 Then each intake port gets an O-ring to seal it against the head. Back at the engine the manifold slides right into place and nuts and washers hold it down. Now the stock valve covers get swapped for the taller black ones. The ignition coils go on, and the plug wires are attached. The dip stick slides into the block and bolts to the head. Then the injector harness plugs in along with the coil harness. Finally the crank sensor goes in followed by the starter. ♪ ♪ Four wheel drive independent front suspension systems have been used on a lot of pickups since sometime in the 1980's. 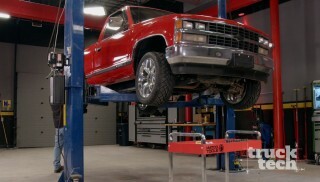 Consumers started demanding pickups that were more and more comfortable. Something they could use every day rather than those old school solid axles, which just rode like a covered wagon. This is a GM eight and a quarter inch front differential that we pulled out of our '88 K-1500, and that's the first year GM used IFS on a full size four wheel drive truck. 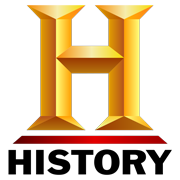 Now a lot of people have no idea how these things work inside or what it takes to disassemble one. So today we're gonna take a closer look, but first we'll do a comparison between an IFS front end and an old school solid axle. They're actually much more similar than you might think. Both have a ring gear inside and a pinion gear that's attached to a driveshaft coming from the transfer, and both have a way to disconnect power from the wheels so you're not spinning the whole driveline when you're rolling down the road. On the old school axle it's out here on the end of the hub, and on the IFS front end it has an electronic disconnect mounted inside the axle. And that's where we're gonna start our teardown. This is a thermal linear actuator and it simply unscrews from the housing. Then a few bolts come out and the diff comes apart. 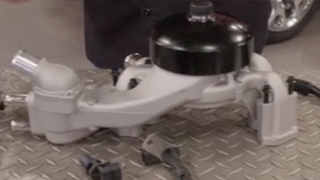 Here we can see the passenger side two piece axle disconnect system. This is what creates the link and power between the spinning wheel and the rest of the drivetrain. It's a cool combination between electronic and mechanical parts, and this is how it works. As you apply 12 volts of power across the coil the actuator heats up inside, expands, and pushes the rod out. Then when you remove power it contracts back in. the actuator installs into the side of the housing, and as it expands the end pushes out against shift fork. There's a small dowel on the outside axle shaft that centers the inside, and as the shift fork extends a collar slides over the splined areas of both part of the axles engaging four wheel drive. Then when you disengage it a spring pushes a shift fork back releasing the collar. Finally there's a small switch that tells the light on the dashboard when four wheel drive is engaged. Disassembly continues with a few more bolts holding the main case halves together, and a pry bar opens them up. The c/v flange on the driver's side is held in with an internal clip. So it takes a bit of force to pop out. From there the carrier comes out and it looks just like any other rear wheel drive differential you're used to looking at. Now that you have the cases fully split you can do several things. Put on new bearings to quiet down a noisy differential, reseal it to prevent a leak, or you can even re-gear because there are a lot of different aftermarket ratios available for the eight and a quarter front end. Now that you've taken it apart it's real easy to put it back together. We've made great progress on this five point three today. I have a few odds and ends left to install. I need to get the main wiring harness on for the fuel injection, find a place to mount the computer, get an accessory drive installed, a cooling system, and a fuel system, but the all-wheel drive conversion is a success. The only thing I have left to finish up on the drivetrain is the rear axle, which needs to be re-geared to match the front. 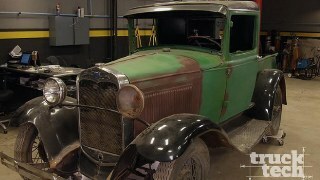 If you want any more information on any projects we build on this show be sure to check out Powernation TV dot com. 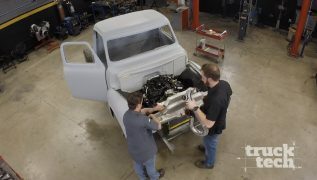 Thanks for watching Truck Tech and we'll see you next time.